Note that since this feature, Dominique has moved to Champagne Moët et Chandon. The brothers Jacobus, Gottlieb and Phillip Mumm arrived in the northern French town of Reims in 1827, from various outposts in Germany where the Mumm family had run successful businesses making and distributing wine. This was the beginning of a house that was to grow into one of the best-known names of Champagne, and one of the most easily recognisable thanks to the vivid scarlet slash across its labels, said to represent the ribbon of the Legion d’Honneur, France’s highest badge of honour. Over the ensuing decades, the Mumm’s adhered to their founders’ mission statement of ‘Nothing but quality’, and carved out a reputation for the excellence of their Champagnes. 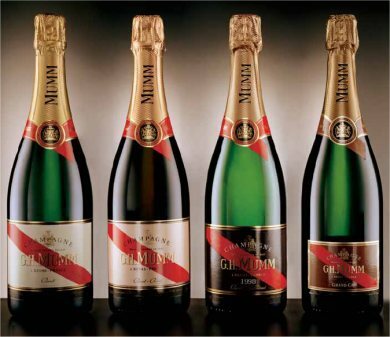 In 1852, Georges Hermann Mumm took over the reins of the house, and as production increased, he began to broaden the reach of Mumm. By 1902 over three million bottles of Champagne Mumm were sold each year – one tenth of Champagne’s entire production. The USA became a major export market, its pre-prohibition drinkers lapping up one million bottles per year. In the 1920s the house of Mumm left family hands, when it was purchased by a group of investors, including René Lalou. Lalou was to become perhaps the most significant ‘Man of Mumm’, spending 50 years with the house, and taking over as President in 1939. Lalou, a Parisian lawyer by trade, oversaw a huge expansion of the business, building the Mumm output to a staggering six million bottles by the early 1970s. The ‘dark years’ that followed saw quality at Mumm deteriorate. Whilst the house retained its position of prominence in consumers’ hearts, many people began to note that the wine itself was seriously under-performing. Something had gone wrong at Mumm it seemed, and through the ’80s and early ’90s the reputation of the great house became tarnished. Many cognoscenti came to regard Mumm as living on a past reputation. Thankfully, things began to improve at the start of the ’90s. Success in turning such a huge ship around cannot be achieved overnight, and cannot be achieved by one person, but a series of changes to Mumm’s business – changes that involved people, winemaking and philosophy – began to have a noticeable effect. In 1991 Jean-Marie Barillière was appointed as Director of Research, Viticulture and Oenology – clearly a wide-ranging trouble-shooting role. That year, brand new cellars for fermentation and assemblage were constructed, and a couple of years later a state of the art computer-controlled disgorgement line was installed. 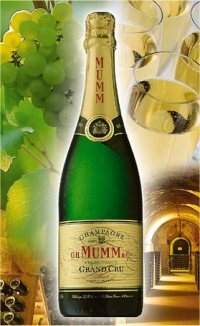 Quality began to improve dramatically, a fact that began to be recognised by tasters and critics, and was endorsed when Champagne Mumm became the first of the large houses to gain ISO 9002 accreditation – a guarantee the wines have no technical deficiencies, which is a target Mumm probably could not have met a decade before. The renaissance of Mumm was well under way, but the most significant piece of the jigsaw was still to click into place, and that was the position of cellarmaster. The Chef de Cave is the crucial winemaking role in a Champagne house, where winemaking, blending and bottling come together under one person’s authority. With Champagne more than any other wine, this is the pivotal point in the whole machine. 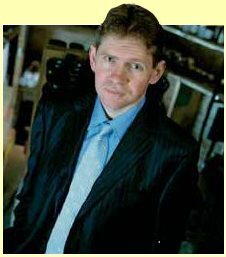 Dominique Demarville made history by becoming the youngest ever Chef de Cave of Champagne Mumm in 1998, at the age of 31. I can only imagine the streets of Reims and Epernay reverberating to the tutting of a thousand Champenoise at this news: the appointment of such a callow youth in such a traditional business must have seemed audacious, if not downright foolhardy. Having studied in Champagne and Burgundy, Demarville’s career began at the small house of Philippe Gonet, then he took in a stint as cellarmaster at Bauget-Jouette, before his move to Mumm. Since then, acclaim has been heaped on Demarville’s relatively young shoulders. The turnaround in Mumm was duly noted by Tom Stevenson, who described Demarville as “an inspired choice” and “truly gifted,” whilst Serena Sutcliffe MW stated that Demarville had “worked miracles” at Mumm. Whatever he was doing in vineyards and cellars, suddenly Demarville’s name was the one on every Champagne-followers’ lips. In fact, Demarville made some sweeping changes at Mumm, though he says “the style has changed gently.” He is using a higher percentage of Chardonnay in his blends, and has increased the diversity of the house’s reserve wines, which he says, “means the choice for the final blending is larger and more precise.” More reserve wines now find their way into the ‘Cordon Rouge’ house blend, and the quality of the base wines is constantly being tweaked. Mumm’s own vineyards extend to 218 hectares, the majority planted to Pinot Noir. In addition, a family of 700 local growers has worked with Mumm for generations. Three-quarters of the Mumm vineyards are in the Grand Cru villages of Aÿ, Bouzy, Ambonnay, Verzy, Avize, Cramant and Verzenay. It is from five of these that Demarville has created Mumm Grand Cru, a Pinot Noir / Chardonnay blend, made with around 18 per cent reserve wines from the best recent vintages. It seems the truth of Mumm’s rehabilitation is in the tasting. These wines are without doubt world class once more: finesse is a hallmark, as is clarity of fruit. It would appear that Jean-Marie Barillière and Dominique Demarville are the latest ‘Men of Mumm’ to have stamped their authority on this great house. Now, part of the task ahead of them must be to alter the perceptions of a generation of Champagne lovers, to reintroduce them to the Mumm style. Given the quality of today’s wines, that shouldn’t be so difficult. What an improvement in this wine, which is dominated by Pinot Noir and contains 30 per cent reserve wines from five different vintages. It has a delicate yet intensely fruity nose, with a nuttiness emerging on the palate and plenty of steely backbone. 89/100. With around 15 per cent Pinot Noir from Bouzy in the blend, this is a distinctly fresh style of rosé with strawberry and gently earthy notes on the nose leading to crisp, fruity palate, where racy acidity and a touch of tannin adds structure. 89/100. Mumm Grand Cru is a terrific Champagne, with a refined, lemony core, and a nutty, honeyed note emerging. The vibrant, crisp apple fruited palate has all sorts of toasty nuances and a fine minerality that is complex and long lasting. 91/100. Proof positive of Mumm’s renaissance (and a bit of a bargain), this has terrific finesse, with brioche and biscuity character melding with lemon and more peachy notes, and a rolling palate of dazzling lemony fruit. Great concentration and length. 93/100. This Blanc des Blancs all-Chardonnay wine from the Grand Cru vineyards of Cramant has a delicate sparkle and a wonderfully vivid apple-pie and citrus nose, with refined lemony fruit filling the palate, and a beautiful edge of mineral acidity. 91/100.